After the initial excitement of finding out we were pregnant settled in, one of my very first thoughts was, “Oh man, how is pregnancy going to affect my skin? Will pregnancy acne take over my life? !” I’m not even going to lie…the thought freaked me out! As someone who’s dealt with varying degrees of acne, from mild to painfully extreme, I expected the worst. …during the majority of my first trimester, my skin remained clear. To the point where I thought something was wrong. Ha! Then when I started travelling a bit more in December, I realized that clear skin for the duration of my pregnancy was not going to be a thing. Unfortunately, my acne issues reappeared at the onset of my second trimester. I remember thinking, “Here we go. My skin is going to erupt, and there’s nothing I can do to stop it.” Luckily, it didn’t “erupt!” Sure, I had a few bumps here and there, but it was nothing compared to what I’ve experienced in the past. 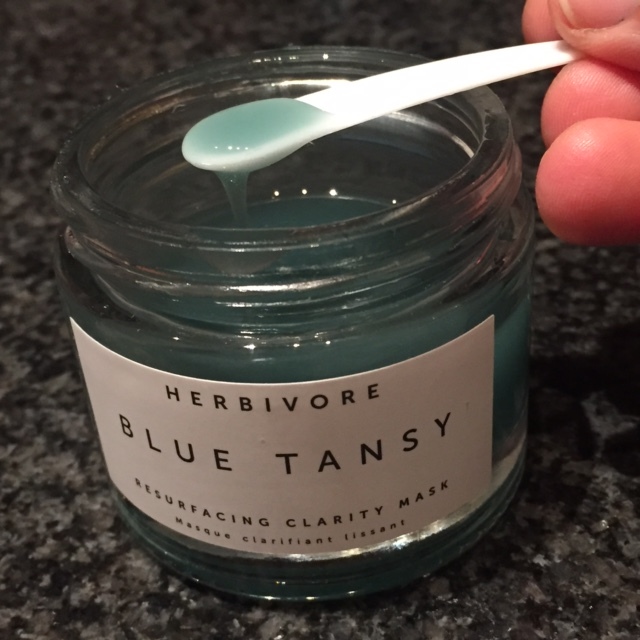 …but then I threw caution to the wind after talking to my friend Thea about my skincare woes and bought a new face mask, the Herbivore Blue Tansy mask to be precise. I asked for Thea’s expert advice on what skincare brands would be good/well suited for my pregnant skin. I wanted to try something that was natural and free of all the yucky stuff. 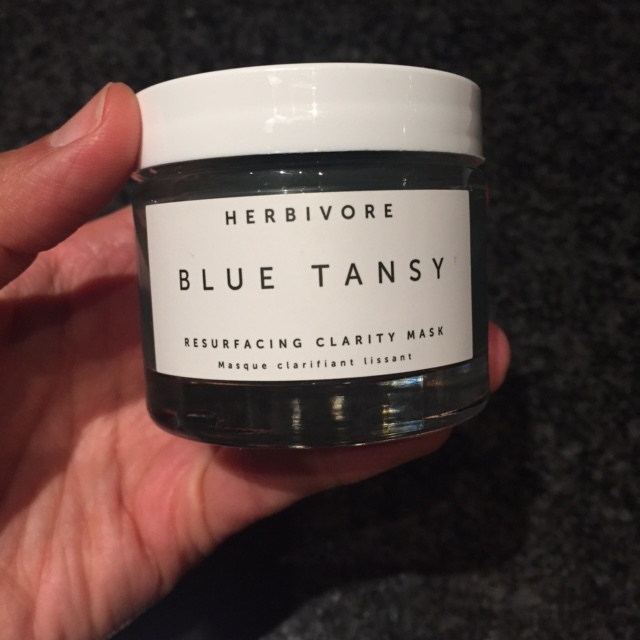 Thea is full of knowledge when it comes to the best brands for different skin types, so when she recommended Herbivore and the Blue Tansy mask, I read more about the brand and the mask itself and decided to go for it. You can read all about the ingredients and what the mask is supposed to do here. I want to share how the mask has impacted my skin. First of all, when you read the reviews (on pretty much any site), you’ll see phrases like “holy grail” and “best product ever.” If you’re anything like me, this will take your already skeptical opinion to another level. But they’ll draw you in at the same time! I want to preface my opinion of this mask by saying that I’ve tried A LOT of skincare products targeted towards acne prone skin.. And I feel like I have a good handle on what works and what doesn’t. With that being said, this stuff definitely works! It helps calm and balance my skin – bumps, redness, all of it. While it doesn’t actively prevent breakouts (at least for me), any existing bumps definitely disappear more quickly than usual after using this mask. My dark spots are getting lighter with every use. I’m not totally in the clear, but it’s helping in a big way. By looking at my skin, you wouldn’t know we’re in the middle of a chilly winter. With the regular use of this mask, my skin is smoother…no flakiness. I feel like my moisturizer works 10x better than it used to. It’s like my skin is a brand new sponge that can’t get enough! BONUS – This product smells so good! It has an herby scent, which lets me know that my skin is in for a natural treat. The final point I want to make is that the price tag for this product may seem a bit steep at first. BUT as Thea would say, think of price per use. I’ve been using this mask for close to two months now, and I’m not even half way through. When you do the math, it’s not bad at all! The bottom line comes down to the fact that my pregnancy acne isn’t nearly as bad as I thought it would be. And investing in good, clean products is always a good idea…pregnant or not. Your turn – do you use masks regularly? What’s your favorite brand? That mask seems interesting..need to look into it, as I too struggle with acne! If you’re into natural skincare, a line that I’be just been introduced to is Odacite. It is all natural, and I just purchased the serum for acne and one for hyperpigmentarion. They use essential oils in their serums and are supposed to be potent, so a drop or two is all you need. Just thought I’d share a product line that would suit you while pregnant. I didn’t get to use any skincare products when I was pregnant. I had cystic acne and breakouts. I only used ice packs to relieve the pain and continue using my gentle cleanser Cetaphil. My husband and I were hesitant about using anything that may cause more harm than good. A little paranoid I know, but this was like 8 years ago when these DIYs are not yet very popular. Thanks for sharing. This will come in handy soon! I want to take the plunge ad buy this product since I’ve heard great things! But any word on the safety of this product while pregnant? I know you used this during your pregnancy, but I keep seeing that AHA’s are safe but BHA not so much. I figure since this isn’t an everyday mask, this would be fine for weekly maintenance. Just wondering if you had any concerns and/or if you advised a doctor first. I, too suffer from cystic acne but I erupted during my first trimester, now nearing the end of my second, I’d like to help the scarring and dark spots left behind. Thanks! So I didn’t specifically talk to my doctor about the mask, but I did some research to make sure it was pregnancy safe. And from what I read, it is. And like you said, it’s not an every day product. I use it about 2x a week. Another product I use (and have been using for a very long time) is tea tree oil. Maybe try that too! Hi I just found out I’m pregnant and I bought this mask before knowing I was pregnant but didn’t get a chance to use it yet. I’ve been researching if it’s ok to use while pregnant and found your blog. did you use it on the first trimester or only on second or third trimester? I’m asking because I read that often first trimester is more dangerous to use certain products. From my research I found that BHAs are not safe for pregnancy. So wondering if you use it during first semester or later. Because I read that second and third trimesters are more forgiving on products since baby is more grown. Please help me. I reached out to the company herbivore but they never replied to me and since you personally use it. It would help me a lot to know from you when did you use it, how often? And in which trimester? I’m already breaking out with cystic acne really bad but want to make sure it’s safe for my baby. Thank you so much for your help. Great blog! Hi! I used the mask every couple of weeks starting around 11-12 weeks. I would highly recommend considering the Drunk Elephant products for your acne. All but one of their products are pregnancy safe (but please do check with your OBGYN first). The TLC framboos night serum and Marula oil in particular may help you. I’ve been using the line consistenly post-partum for a few months now (I had HORRIBLE acne immediately after delivering), and my skin is the best it’s been in a couple of years! I hope that helps and most importantly, CONGRATULATIONS!! Hi. I don’t usually comment but I had to tell you: I took your recommendation and splurged on the Blue Tansy mask and OMG results! I’m pretty jaded with skincare, but this product has basically been a miracle-worker. Totally smooths out residual bumps/dark spots from breakouts—not to mention the mask has pretty much stopped every nascent pimple in its tracks, since I started using it. This makes me so happy! Glad the mask worked for you 🙂 You’re comment has motivated me to get back into my routine of using it.